From large organizations to start-up ventures, human capital is a key to success in all organizations. Growth stems from developing the unique competencies, technical knowledge, and people-skills found within individuals, teams, and businesses alike. The Birkman Method® develops and enhances the human capital within organizations and helps individuals realize their inner potential. Building better insights into human capital is the driving force behind creative solutions, trusting relationships, effective processes, and action-oriented goals. The Birkman Method® helps unveil these hidden qualities within leaders, employees, and teams. 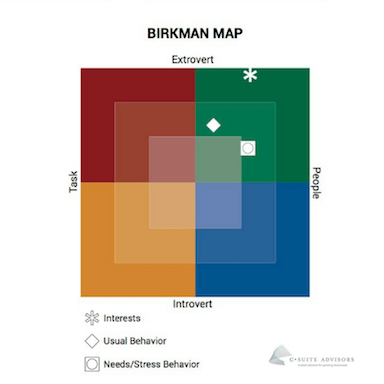 Our scientifically developed, multi-dimensional assessment, The Birkman Method®, provides personality and occupational data to help understand individual’s unique behavior and work satisfaction across different situations and industries. The Birkman Method® reaches further into personality than any other assessment, allowing for individuals to truly understand not only who they are, but why. Needs are what individuals crave from their environment and the people around them. Needs vary widely between people, and they are not observed simply from behavior. The Birkman Method® is the only assessment that is able to get to the heart of an individual’s underlying Needs which, when fulfilled, provide the comfort and motivation that enables them to be productive and satisfied in their careers and lives. The Birkman Method® is distinct because it taps into what an individual believes about “most people” around them, providing a unique glimpse into one’s perception of both self and others. There are many factors that affect a person’s career performance and satisfaction. Just looking at motivations doesn’t give the full picture. Through one questionnaire,The Birkman Method® can generate more than 40 reports for specific applications and solutions to your needs.